Entergy Corporation – New Orleans, LA. Coming Soon . . . . Unlock procurement opportunities by Registering FREE in our Gulf Coast Diversity and Inclusion Database Directory. Take a moment to fill out and return the 20th Annual GTMBC Golf Classic Tournament Registration Form. Please click here to download: GTMBC Golf Classic Registration Form pdf. Email the Form to hatcher.beverly@gtmbc.com “or” Fax to 1.409.722.5402. See you September 21st. The Golden Triangle Minority Business Council’s Gulf Coast Diversity and Inclusion Division was pleased to co-host along with the U. S. Chamber of Commerce a featured special guest speaker, Ted Phlegar. Ted, as Senior Counsel for the Workforce Freedom Initiative (WFI) at the U.S. Chamber of Commerce spoke about the initiative which is a grassroots, education, and advocacy campaign to preserve workplace democracy and addressed the new labor rules and regulations that all employers and future employers should be aware of. The “complimentary” special dinner was held Tuesday, March 10, 2015, at the L’Auberge Casino Resort, in its premier luxurious Asia Restaurant. Those in attendance are pictured above. The Statewide Historically Underutilized Business Program 2015 Procurement Connection Seminar & EXPO was held at FORD Park Event Center, in Beaumont. 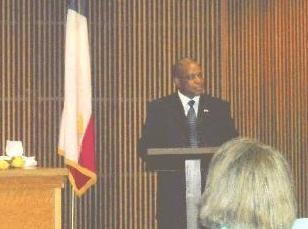 State of Texas Representative Deshotel said, “Over the years I applaud the collaboration of the Texas HUB Program and the Golden Triangle Minority Business Council who work tirelessly and diligently to promote the growth and competitiveness of our State’s HUB community. And the successful results speak for themselves.” He concluded, “Supplier diversity can be beneficial to both the seller and buyer, and as the District 22 State of Texas Representative, I remain committed to work to increase awareness of the State’s HUB Program." Pictured above are those in attendance during the EXPO Luncheon. The Golden Triangle Minority business Council held its 25th Annual Holiday Awards Reception at the Rogers Visitors Center in Beaumont. According to President Beverly Hatcher, “We wanted to recognize all eight corporations that founded GTMBC 25-Years ago. The corporations are TOTAL; Shell Oil; Valero; Huntsman; DuPont; Entergy; ExxonMobil; and, Chevron. And knowing that the years 2015 and beyond will be packed with billions of dollars in contract opportunities along our Gulf Coast region, the festive event was a great marketing and networking venue for the attendees. The Southwest Louisiana Economic Development Alliance became a member of the Gulf Coast Diversity and Inclusion Advisory Board. The group – with representatives from Fortune 500 companies and other state and local agencies – will focus on small business and entrepreneur diversity and inclusion, and workforce and jobs diversity inclusion. 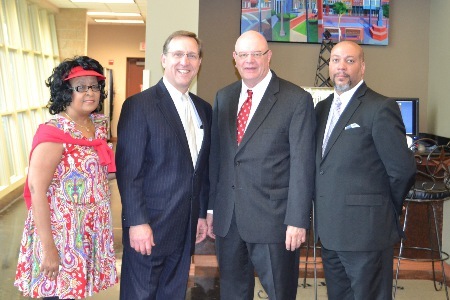 Pictured from left to right: Beverly L. Hatcher, President of the Golden Triangle Minority Business Council, Jefferson County (Texas) Judge Jeff Branick, Golden Triangle Minority Business Council Corporate Advisory Board Chair, George Swift, President and CEO of the SWLA Economic Development Alliance, and Eric Cormier, Alliance Special Projects Manager. It will be a pleasure to welcome all Sponsors, Golfers, Volunteers and participants to the Golden Triangle Minority Business Council’s 20th Annual Golf Classic Tournament fundraiser. This year’s tournament will “only” be a morning flight and will be held on Monday, 2015 date TBA. COMING SOON, for Sponsor Information and Team(s) Registration. The Golden Triangle Minority Business Council has been proud to be the leader in Southeast Texas promoting Minority Women Owned Small Business Enterprises, and on August 2, 2010, celebrated yet another milestone achievement in its years of history by signing documents as an “approved certifying agency” for the State of Texas HUB program. Mr. Paul Gibson Manager of the Statewide Historically Underutilized Business (HUB) Program holds the prepared Memorandum of Agreement HUB Certification as he brings greetings to the Board of Directors of the Golden Triangle Minority Business Counci on behalf of the TPASS. 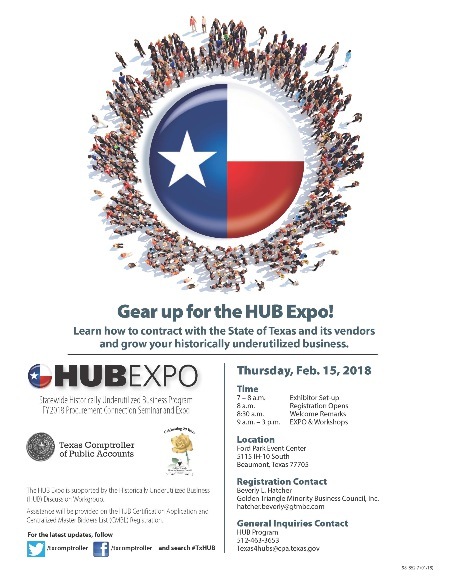 The Texas Comptroller of Public Accounts (CPA) administers the State-wide Historically Underutilized Business (HUB) Program for the State of Texas, which includes certifying minority and woman-owned businesses as HUBs and is designed to facilitate the participation of minority and woman-owned businesses in state agency procurement opportunities. The CPA has established Memorandums of Agreement with other organizations that certify minority and women-owned businesses that meet certification standards as defined by the CPA. The agreements allow for Texas-based minority and women-owned businesses that are certified with one of our certification partners to become HUB certified through one convenient application process. The signing of the Memorandum of Agreement between the State of Texas HUB Division of Comptroller of Public Accounts (CPA) and the Golden Triangle Minority Business Council (GTMBC) “officially” approves GTMBC’s HUB certification program, pursuant to Texas Government Code §2161.061. The Golden Triangle Minority Business Council’s petition to the State of Texas to establish a HUB Certification Memorandum of Agreement (“MOA”) with the Texas Comptroller of Public Accounts has been “approved.” This is an overwhelming milestone in advancing the value and foundation of the Council as the Gulf Coast region’s leading certifying agency for “all local” Minority, Women, and, Small/Disadvantaged Business Enterprises. 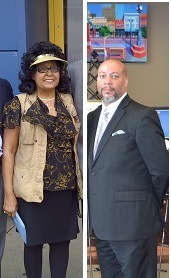 In accordance with the Memorandum of Agreement the Texas Comptroller of Public Accounts (CPA) has established with the Golden Triangle Minority Business Council (GTMBC), and we are pleased to inform our M/WBE/HUB Vendors, Corporate Sponsors and Friends of GTMBC, qualifying small businesses may now be certified as a HUB through the Council. More details soon. Noted: The GTMBC is a 501 (c )(3), Federal Tax I.D. Number 76-0549413. On April 27, 1989, after formally filing with the Secretary of the State of Texas an official Certificate of Incorporation, Charter No. # 1112115 was duly assigned to the Golden Triangle Minority Business Council as a Texas Non Profit Tax Exempt Corporation. Responsive to the need for its formation, Chevron, Du Pont, Entergy, Exxon Mobil; Huntsman, Motiva, Total, and Valero came together as the Founding Charter Corporations to launch the Golden Triangle Minority Business Council. "The purpose of the Golden Triangle Minority Business Council is to promote, educate and develop ethnic minority businesses and women-owned of all races small business enterprises."